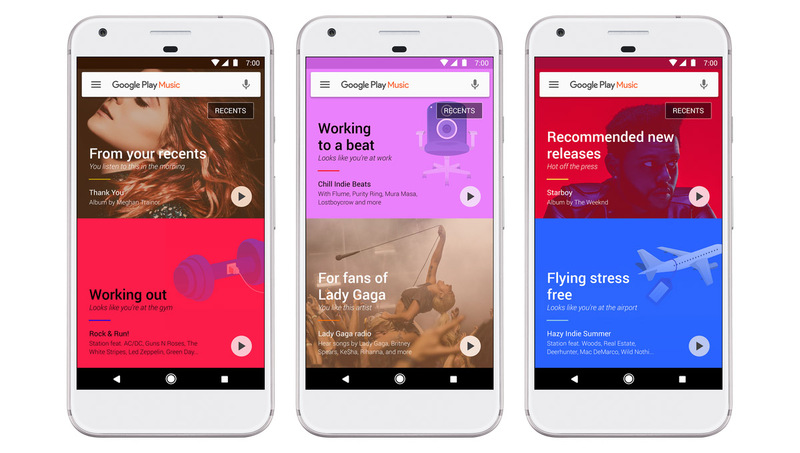 Google announced a major update to Google Play Music this morning, one that will show you smarter and timelier recommendations with a new home screen layout and always-available offline playback. This is a big one, and it starts arriving today. Up front, when you open the new app after updating, Google is showing you a new layout that they are calling the “ultimate personal DJ.” That means bigger cards of playlists and stations of “what you like, but also when you like it.” The images above give you a good feel for how this will look, including a “Recents” button, that we’re assuming gets you into recently played tracks. The update isn’t live yet, but my gut tells me that there is more to this new interface than just a fancy new home screen. Outside of the UI changes, Google is applying its machine learning secrets to music now. Those secrets should get you proper music and mixes based on location, activity, and even the weather, according to Google. This is an opt-in feature, so none of it will happen out of the box. Should you opt-in, your musical choices could change at work, while flying, when in new cities, or as you hit the gym. Finally, a new offline playlist will be automatically stored for you, of songs that you listened to recently (probably that “Recents” button). Assuming you charge your phone regularly, songs will be stored and available even if you lose a data connection. Google says the update arrives today, but we aren’t seeing it quite yet. Let us know if you do!